Day 1 Wrap-up: After 5 rounds of Standard, a few things are crystal clear. Firstly, the format has NOT been solved and remains extremely diverse. Secondly, if there’s a new card that is present in a ton of different decks, and often as a 4-of, that card is Deathmist Raptor. I missed this card entirely during preview season, but I’m now thinking it can hit $25-$30 and make buy-in at the current price on sets worthwhile. Den Protector is also making moves today, and to a lesser extent the cards from the ‘Flayer deck, but my money is on Raptor to jump if it makes Top 8 in multiple decks. Wescoe is running an entirely new archtype in Ojutai Bant, with 2 copies of the Dragonlord Ojutai. Also features Haven of the Spirit Dragon, Surrak, the Hunt Caller and Mastery of the Unsee. Um, I’m in love. Wescoe took first game with deck engine running hot. Won 2nd game too. Awesome. 12:35 pm: Den Protector run is real. It’s jumped from $1.50 to $4 already today. 12:15 pm: Narset Transcendent on camera in Valdivias’ Esper Control, facing Ancona (Abzan Control). Dragonlord Ojutai joins the board and Valdivia takes the game. 12:13 pm: Rade plays a Thunderbreak Regent on camera for the first time today. Wook combos off again to put in doubt the possibility that R/G dominates the event. 11:45 am: Olle Rade (!) on Red/Green Dragons vs. Nam Sung Wook on Jeskai Combo. Wook takes Game 1, comboing off from the razors edge of doom. 11:05am: Strength of the Fallen just took down Turtenwald and earned a Deck Tech as a result. 11:01am: Elspeth featuring prominently in the Chapin/Ancona Abzan mirror match as well. Chapin loses on a technicality, dulling the presence of Ajani, Mentor of Heroes on board. 10:55 am: Madden scoops to Elspeth in Game 2, demonstrating amply that the Iron Lady is not done ruling Standard quite yet. 10:47 am: Froelich goes to 6-0 on the back of Jeskai Ascendancy. Why is this busted card still just $2? Could easily be $6 in the fall as new combo pieces appear, though losing Caryatid could hurt at least one build. 10:21 am: Owen Turtenwald (Abzan Control) vs. Steve Madden (Strength Devotion). Madden is running the full 4 copies of Strength of the Fallen. As an uncommon with narrow applications, steer clear of this as a spec, but yeah, this Standard season should go down in MTG history as the best one ever. Chord of Calling just made an appearance pulling out Nylea to win Game 1 for Madden over the former Player of the Year. 10:18 am: 5-0 players include Froelich, Chapin, Floch, Rubin and Sullivan. 9:46 am: Parke puts Torrent Elemental into play in game 2 to complete his presentation of outsider mythics and rares. Den Protector comes out from Parke again to good effect. I’m in for 12 copies at $1.25 in case this goes somewhere as the tournament progresses. (This is not wise behavior btw.) Elspeth pushes through to put Manfield on top for Game 2. This match ended in a draw. 9:31 am: Osooka (sp?) is 2-0 in Standard over Josh McClane with U/B control. 9:26 am: Chapin on Abzan mid-range drops his first game. 9:23 am: Abzan Aggro piloted by Nakumura takes Game 1 from Willy Edel on Whip. Nakumuras’ deck was designed by Brian Kibler, and includes Dromoka’s Command, God’s Willing and Boon Satyr. Edel is also using Sidisi, Undead Vizier in his Whip deck. 9:13 am: Seth Manfield (Atarka Abzan) vs. Jamie Parke (Chromantiflayer). Parkes’ deck notably features Deathmist Raptor, Soulflayer, Pharika, God of Affliction and Chromanticore. Manfield build is mid-range Abzan with Dragonlord Atarka at the top end where Hornet Queen used to reside. Were you expecting a deck with Atarka and Elspeth? Sidisi, Undead Vizier demonstrates synergies with Elspeth, Sun’s Champion in the Abzan control shell. Parke makes effective use of 2 copies of Den Protector to return Raptor and kill spells to his advantage. Parke then causally throws down a Silumar, the Drifting Death to hold off Elspeth from dominating the board. As a follow up Chromanticore gets bestowed on to Soulflayer to create an absolutely insane multi-talented attacker and take Game 1 from Manfield. 8:35 am: Tian fails to go off fast enough in Game 3 and loses to Floch after a very slick play with Bile Blight on Floch’s own Caryatid to clear away the firebreathing tree on Tian’s side of the table. 8:09 am: Makihito Mihara vs. Shaun McLaren: Both players on Abzan control builds. Mihara notably running See the Unwritten. McLaren puts Elspeth back on stage to take control of the game and wins the match 2-0. 8:00 am: Lee Shi Tian vs. Ivan Floch: Tian is on Jeskai Ascendancy Combo. Floch is on Sidisi Whip. Tian combos off like it’s November 2014 to take Game 1 in under 5min. Thoughtseize puts Tian on the back foot in Game 2. Tian running Reviving Melody out of the sideboard but it doesn’t prevent him from failing to go off in Game 2. 7:54 am: Randy Beuhler calls our Zurgo, Dromoka’s Command and Thunderbreak Regent as the DTK money cards most likely to make an impact on the Standard format. Just two short months after Pro Tour: Fate Reforged and a lively Modern metagame, here we are at the doorstep of another epic battle between top Magic: The Gathering pros from across the globe. Over $250,000 USD is on the line, with the winner taking home a hefty $40,000. As per usual, the Pro Tour weekends now feature a mix of booster draft (DTK-DTK-FRF) and constructed formats with 3 rounds of draft Friday morning, followed by 5 rounds of Standard starting around 3am EST. For the MTG Finance community, the big question on all of our minds is whether any new cards from Dragons of Tarkir will break into the spotlight in Standard and push our recent specs into profitability. Will there be a chance to get in on something that shows early promise or will the hype train leave the bandwagon speculators out in the cold without buyers come Monday morning? Many of the top teams have been in stealth mode for the last couple of weeks, furtively holed up in Belgian castles attempting to break a format open that has stubbornly refused to allow a single deck to dominate for the duration of an amazingly varied season. With Standard starting around early Friday morning EST, the stage is set for first mover advantadge if an unexpected deck jumps out to an early lead in the hands of a reliable pilot. Which deck are you rooting for? Dragonlord Ojutai: Prince or Pauper? 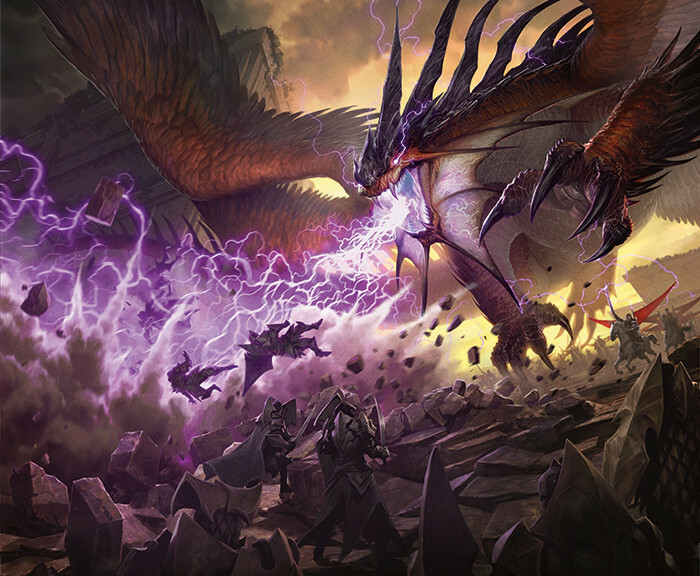 During the first week of Standard legality for Dragons of Tarkir, Dragonlord Ojutai showed up in a handful of promising control builds, but failed to make the Top 8 at any prominent events. PTDTK may well prove to be his defining moment, either establishing his role as a format defining threat or seeing him sidelined as a Tier 2 curiosity destined for occasional casual play. Most of the smart money that got in around $5 during pre-orders is already selling into the hype, as at $17 or so there isn’t much meat left on the bone. That being said, a great performance here could push this mythic rare into the $20-25 range. Surrak, the Hunt Caller: Underrated Beatstick? At the SCG tourney last weekend Surrak, the Hunt Caller was all over the Top 8 as an integral tool to push through damage in the Green/Red mid-range decks that seem poised to claim top spot in the evolving metagame. For those who snapped up copies around $2, a recent move to $5 could be the exit point they need, but if G/R dominates 20-50% of the top 8, there may be room to run up towards $8 for this hot legend. Thunderbreak Regent: Free to Fly? Stormbreath Dragon and Thunderbreak Regent are swinging through the skies more and more regularly as the G/R decks test their capacity for ascension in Standard. Regularly put to work as a 4-of, the Regent is already sky high pricewise as a $12+ rare. I’d steer clear of this guy, but keep in mind that further success makes the DTK Event Deck (which includes Thunderbreak Regent, Surrak, Yasova, Outpost Siege and 2x Rending Volley) a total free roll. Peaking near $20 just a few weeks back, this central presence in the Master of the Unseen devotion archetype has fallen back towards $12 as the metagame shifts away from the only deck in the format capable of regularly generating hundreds of life. With another year left in the tank before rotation, a poor showing at this Pro Tour could be a good opportunity to get in on this guy, as his raw power level suggests fresh opportunities may arise to abuse him come the fall. Stay tuned for Round by Round MTG Finance coverage of Pro Tour Dragons of Tarkir! Worth mentioning that Surrak gives Whisperwood Elemental haste, which is the only thing that card was really ever missing. I think you could very easily mash those last three cards together into a deck. Wow, no mention of See the Unwritten in Miharas deck? Thats a pretty important point…. Thanks for the Breakdown! I think Den Protector is going to be the breakout rare here for sure. Keep a close eye on that one! I think we all underestimated this lil dude. He puts in work! Deathmist Raptor has proven that it has a home in Standard. Will it find a home in Modern or somewhere else? Do you think foils are a good pick-up? The regular version of the card has almost hit $20. Foils can still be bought for $25 in some places. Thoughts?